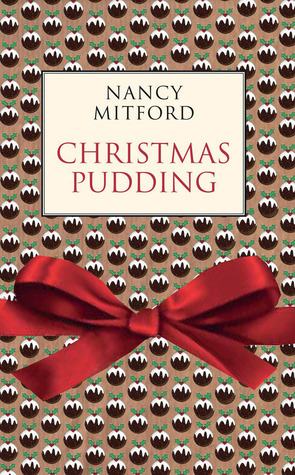 I discovered Nancy Mitford’s Christmas Pudding courtesy of French blogger Emma’s review at Book Around the Corner and began a search for a copy immediately. How could I not when Emma had this to say? This novel is to Britishness what baguettes are to Frenchness. They keep calling each other ‘darling’ and it’s like their tongue was speaking with their pinkie in the air. But I had never read Nancy Mitford! She was one of those authors that my parents referenced, but there were none of her books in the house. This was possibly because my mother did not approve of Mitford’s infamous essay about U and Non U English (later published in Noblesse Oblige), reminding us that it was vulgar to talk about class yet hovering over our British vocabularies to stamp out any ‘dreadful’ affectations such as ‘serviette’, ‘dessert’, ‘lounge’, ‘on-velope’, or ‘pardon?’ I always knew what she meant when she said ‘She’s a bit of a Hyacinth‘; my mother was only a snob about snobbery. Christmas Pudding was quick and easy to read, and the satire is amusing without being spiteful. It satirises The Country House Novel with a gathering of disparate souls in Gloucestershire, where Lady Bobbin is in high dudgeon because The Hunt has been called off owing to an outbreak of foot and mouth disease, and Amabelle Fortescue has taken a large mock Tudor house called Mulberrie Farm to amuse herself and her smart city friends. City and country are brought together by Paul Fotheringay, in deep despair because his first book, penned as a poignant tragedy, has been hailed a great comic success. To console himself, he decides to write a biography of Lady Bobbin’s ancestor, a Victorian poet by name of Lady Maria Almanack, but is brushed off by Lady Bobbin when he requests permission to research the poet’s journals. To gain access he poses as a tutor to Lady Bobbin’s son, setting up the situation where Bobby, in his final year at Eton, can amuse himself at nearby Amabelle’s, and Paul can read the journals undisturbed. There are sixteen characters altogether: like Austen’s characters, the women need to make a good marriage, while the men (who are all Etonians) need to have money without actually having to work. (Amabelle and Michael Lewes (marking time in the diplomatic service) are the only ones who seem ever to have had a ‘job’). There is one marriage where the couple actually love each other, but they are marked down as a bit odd. There is also a set of rather droll musical obsessives called Squibby, Biggy, Bunch and Maydew. The plot, such as it is, revolves around the potential discovery of Paul’s real identity, and the love triangle between Paul (who is ‘not acceptable’ in either guise), his rival the lugubrious Michael Lewes (who is really in love with Amabelle, who won’t have him) and Lady Bobbin’s daughter, Philadelphia who is bored witless by country life and irritated by her gorgonesque mother (as anyone would be). Mitford is often compared to Evelyn Waugh (1903-1966), one of the great British authors of the 20th century. I discovered his novels some time in the 1970s and read eight of them (i.e. all the famous ones that were available from friends, family and the local library). IMO if Christmas Pudding is anything to go by, Mitford is good fun, but a bit lightweight by comparison. Waugh was much more than a satirist of upper class life. Still, Mitford is listed in 1001 Books and I have yet to read Love in a Cold Climate so I may in due course discover that there is more depth to her mature writing than the light-hearted comedy of manners in Christmas Pudding. The Toast published an interesting article on Nancy Mitford a few weeks ago: http://the-toast.net/2015/12/28/nancy-mitfords-two-good-novels/. The Pursuit of Love and Love in a Cold Climate are both well worth a read but they are different to Waugh (who I also love). Oh, my goodness! I had forgotten all about U and Non-U English! Like your mother, Lisa, back in the 1950s mine also was determined to expunge all Non-U (i.e. middle-class) terms from our vocabulary. Taboo words included ‘toilet’ for lavatory, ‘perfume’ for scent, ‘couch’ for sofa, ‘pass away’ for die, ‘home’ for house, ‘serviette’ for napkin, ‘lounge’ for sitting room, ‘dessert’ for pudding, ‘I beg your pardon?’ for ‘What did you say?’, ‘Pleased to meet you’ for ‘How do you do?’, and many more. She took it all very seriously indeed. As a suburban doctor’s wife, and the daughter of a self-made furniture retailer, I don’t know how she imagined this would magically elevate her (and us) to the upper classes, but she was determined to try. Thanks for the memories! *chuckle* I pity any mother who tried to do it today. Being French, I find this comment fascinating. I’ve never heard of such thing as Non-U terms. *chuckle* One of the things we love about the French is that it’s not obsessed by class distinctions the way that the British still are. But I wonder, are there ways in which the French link the use of certain words with a person’s origin, to make any kind of judgement about a person? I read lots of both Mitford and Waugh when I was younger, though not Christmas Pudding. Mitford isn’t as literary as Waugh but she is also not the social climber (didn’t need to be!) that Waugh was. The introduction also refers to Wodehouse, but I never took to his books. *chuckle*, Ros, I agree, I liked Cold Comfort Farm, and I think it has better ‘staying power’ than Christmas Pudding which represents an era long gone. I’ve included Nancy Mitford’s The Pursuit of Love in my Classics Club list, which I’m looking forward to immensely. Hi Jacqui, my reading of this book is another of many examples of the way we in our network of bloggers – a community of readers who’ve never actually met each other – influence each other as well as our readers. PS It was your review of Mona Lisa that finally made me lash out and subscribe to Pushkin Press! Lovely! I hope you enjoy your subscription – I’ve yet to be disappointed by a Pushkin. I’ve bought quite a few as single copies, (mostly because of Stu at Winston’s Dad) but just not subscribed before. It’s a fun and light read, isn’t it? Like we say in French, c’est un bon moment de lecture. The characters have all ridiculous traits but she’s never mean. ‘Un bon moment de lecture’, I like that expression! I can’t remember the last time I read books by Nancy Mitford, probably back in the 70s. Thanks, it was great to read her again. A delightful and witty story, and one that I had not read. One of the best things about litblogs is that (unlike most newspaper reviews) we don’t have to confine ourselves to new releases. I love reading other bloggers’ reviews of books that I read a long time ago, it brings back good memories. That is so true! In the last couple of days I have picked up some very good reads from you and Sue.